Dr. Behrooz Hakimian is a board-certified radiation oncologist based in West Hollywood, California. He graduated from the Keck School of Medicine of USC and then did his internship at the VA Greater Los Angeles Healthcare System. He completed his residency in Radiation Oncology at the University of California Irvine. Dr. Hakimian has been practicing for more than two decades and is presently affiliated with the Cedars –Sinai Medical Center. He has also contributed to two research publications. Dr. Behrooz Hakimian has contributed to 2 publications. The science and practice of bone health in oncology: managing bone loss and metastasis in patients with solid tumors. Lipton, A., Uzzo, R., Amato, R. J., Ellis, G. K., Hakimian, B., Roodman, G. D., Smith, M. R.; J Natl Compr Canc Netw. 2009 Oct 01. Wedge resection and brachytherapy for lung cancer in patients with poor pulmonary function. 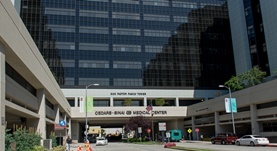 McKenna, R. J., Mahtabifard, A., Yap, J., McKenna, R., Fuller, C., Merhadi, A., Hakimian, B.; Ann Thorac Surg. 2008 Feb.